Never mind Computing being as easy as making a cup of tea, what about its relevance in designing a functioning coffee break line..? This was in evidence at Rising Stars and CAS’s comprehensive Computing CPD event this morning. 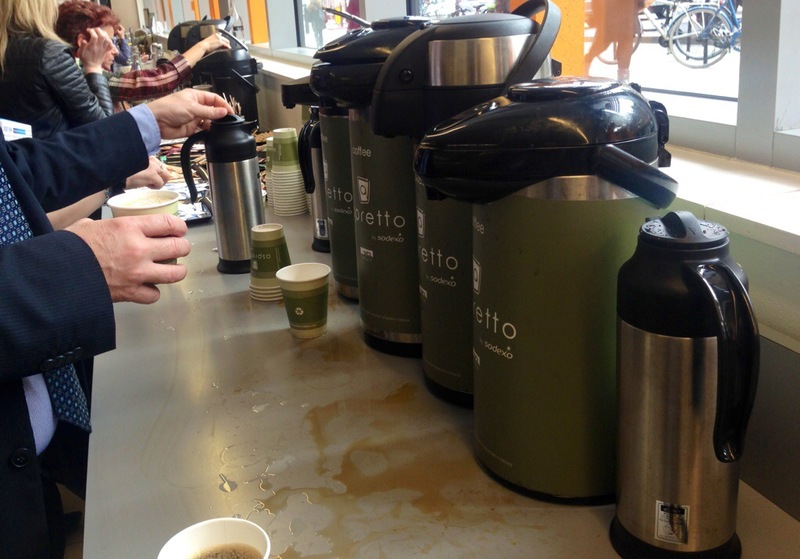 After a wonderfully clear and informative explanation of the new Computing curriculum by Miles Berry, we broke for coffee, and a coffee line that justified the use of the term ‘broke’. Four coffee pots, with only one at a time being used due to where they had been set out , a line where people had to go back and get in the way of others in order to get their milk, and delicious croissants that no one was taking simply because lids had been left on their containers (cue ‘are we allowed them yet..?’). No disrespect to the organisers, the ubiquity of such problems at conferences suggests they aren’t easy to solve, but a nice reminder that the design of systematic processes and the linking of algorithms to execution goes way beyond programs implemented on digital devices. I’ve been working with quite a few businesses and startups recently, and so often those who show the signs of success are those who systematically consider the processes with which their products and services will be used. Much of their work seems to be the ‘debugging’ and refining of these to the point where they don’t just get the job done, but do so efficiently and elegantly. Getting the coffee out with a bit of mess and annoyance is still getting the coffee out, but in a competitive world creating a seamless experience is what can make the difference of whether you are asked to do it again. The economic argument for the importance of Computing education is potentially much more far reaching than a lack of ‘coders’.